While you're getting things setup, it's common to want to have the Assistant installed, but not appear for your users so you can fully test things out end to end without exposing the Assistant until you're ready to go live. You can now safely install the Assistant, knowing that it won't appear for your users. 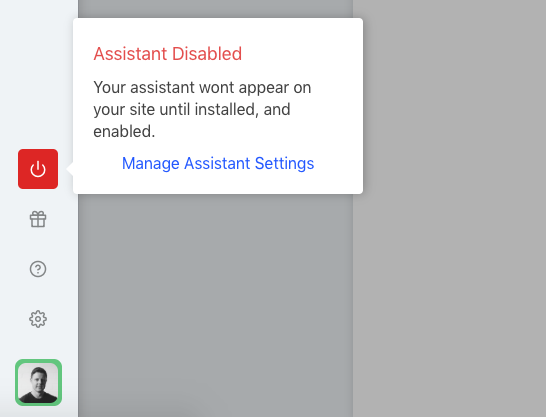 While the Assistant is in a disabled state, you and your team can still test things out by forcing it to load at will. This will force the Assistant and any helpers / hotspots you've added to load, so you can test things end to end. NB If you follow a link on your page, it will likely lose the setting in the URL, so you'll need to manually add that section back to the URL on the new page you browse to. When you're happy and ready to go live, simply enable the Assistant from the main settings screen.